We love the uniqueness of restored 19th century carriage houses, in part because we don’t see them on the market as often as standard-issue townhouses. In this case you get two chances at owning one: Adjacent carriage houses at 409 and 411 Vanderbilt Avenue in Clinton Hill just emerged from top-to-toe renovations by designer fix-and-flip favorites The Brooklyn Home Company. They’re up for sale for $3.4 million and $3.35 million, respectively. 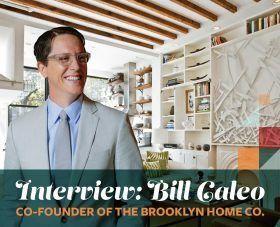 The Brooklyn Home Company (THBCo) is a family-run cooperative of artists and builders that develop unique residential spaces in booming Brooklyn. Best described as white and wood but never cookie cutter, their work is always light and airy, and blend modern style with historic elements. It’s this signature style that’s made THBCo a favorite amongst both renovators and Pinterest enthusiasts alike. But what inspires their designs and how do they decide where to develop projects? Ahead, 6sqft speaks to THBCo’s co-founder and Head of Operations, Bill Caleo, about the business. Find out how this family-run establishment firmly roots itself in working with local makers, how they’ve grown their business model to include sustainability, and why they always add a custom piece of art to all their homes. Though they’re charming and often in great neighborhoods, condos created from historic townhouses often disappoint. Railroad-style layouts get circumvented by oddly-configured hallways (left resembling a linear “ant farm” accessed by tunnels), kitchens are across the apartment from living rooms, bedrooms get subdivided into virtual closets, and so on. 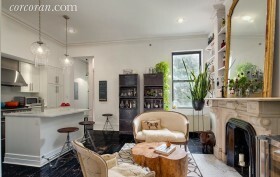 This lovely two-bedroom parlor-floor home at 122 Fort Greene Place in prime Fort Greene escapes most of those fates, and interiors by popular brownstone Brooklyn design firm The Brooklyn Home Company elevate it even further into the charm circle. The $1.6 million ask may seem high, but a sizable 1,384 square feet, tons of restored original details within a superb renovation, stellar location, and designer showcase status (it was featured in the coffee-table-favorite “Design Brooklyn,” and a slew of interiors mags) rack up plenty of selling points. This meticulously renovated four-story townhouse located at 27 7th Avenue in Park Slope is a stunning example of the “best of both worlds”. While careful to retain gorgeous period details such as decorative mantels, original millwork, plaster mouldings, pier mirrors and pockets doors, The Brooklyn Home Company left no stone unturned in its quest for modernity within the home’s classic interior. From making the list of most popular baby names, to having whole stores devoted to its wares, Brooklyn has become quite the brand these days. But for a classic feel of living in the borough that bucks trends, we can always look to The Brooklyn Home Company for their tasteful, functional, and timeless spaces — like this stunning 5th Street Park Slope townhouse. The firm undertook the entire interior/exterior renovation, as well as the nine-foot extension that was added to the garden and parlor floors, those which the building owners occupy. 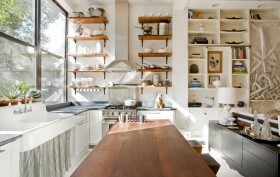 They transformed the space with a mix of historic and modern details, custom built-ins, and impressive millwork. During the demolition, the original beams were discovered behind the drop ceiling, a feature that was left exposed and now anchors the entire living space.